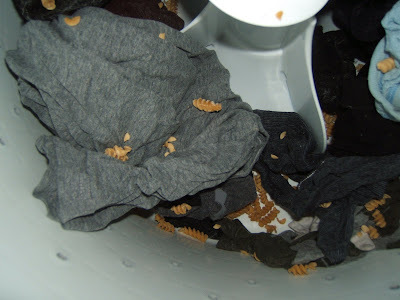 There's Pasta in my Wash! After going to bed last night, I remember I have laundry to put into the dryer. I get up and start pulling it out of the washer and all of a sudden pasta is flying everywhere! I am so exhausted at this point that I just start laughing. I think to myself, "maybe this is just a bad dream! ", and I'm so tired that I just leave it there hoping that I'll wake up and it will be gone in the morning. Well, it's morning and the pasta's still there. I'm still trying to figure out how it got there!!! Check out these great, "day in the life of" posts at Montessori Free Fall where Steph gives us a look into her Preschoolers Montessori day!